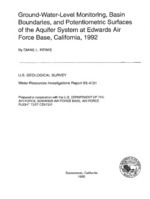 Ground-water-level monitoring, basin boundaries, and potentiometric surfaces of the aquifer system at Edwards Air Force Base, California, 1992; 1995; WRI; 95-4131; Rewis, D. L.
A ground-water-level monitoring program was implemented at Edwards Air Force Base, California, from January through December 1992 to monitor spatial and temporal changes in poten-tiometric surfaces that largely are affected by ground-water pumping. Potentiometric-surface maps are needed to determine the correlation between declining ground- water levels and the distribution of land subsidence. The monitoring program focused on areas of the base where pumping has occurred, especially near Rogers Lake, and involved three phases of data collection: (1) well canvassing and selection, (2) geodetic surveys, and (3) monthly ground-water-level measurements. Construction and historical water- level data were compiled for 118 wells and pi-ezometers on or near the base, and monthly ground-water-level measurements were made in 82 wells and piezometers on the base. The compiled water-level data were used in conjunction with previously collected geologic data to identify three types of no-flow boundaries in the aquifer system: structural boundaries, a principal-aquifer boundary, and ground-water divides. Heads were computed from ground-water-level measurements and land-surface altitudes and then were used to map seasonal potentiometric surfaces for the principal and deep aquifers underlying the base. Pumping has created a regional depression in the potentiometric surface of the deep aquifer in the South Track, South Base, and Branch Park well-field area. A 15-foot decline in the potentiometric surface from April to September 1992 and 20- to 30-foot drawdowns in the three production wells in the South Track well field caused locally unconfined conditions in the deep aquifer.